A prayer is a person’s connection with the upper force that reflects only his or her perception of it. There are people who pray asking for a better life in this world, there are folks who pray for the future world, and there are those who don’t pray and don’t believe in the upper force. Still, they do think about their future, and every such thought is regarded as a prayer. But whom I am asking, however, is a whole other matter. Is it nature, fate, something unknown, my future state, or an upper force that can be bad today and good tomorrow depending on my request? A prayer is the action I take in regard to the subsequent moment in hopes to achieve a specific state, meaning that this notion includes various states, but all of them divide into two parts depending on to whom I pray: Is it someone that changes and whom I can force to change? That is when people start looking for hidden ways to gain control of the upper force so that it would become more kind and change present reality and the world. This hope to bribe the upper one is the basis for all mystical and religious quests. A person of this world who lives in his or her egoism thinks it’s possible. However, there is another, very rare approach that says that the upper force can’t be changed; rather, you need to know how to alter yourself by using the forces nature programmed within you. It is the method of Kabbalah which opposes all other methods. It doesn’t matter whether a person thinks there is one God or many, imagines himself facing nature or any other upper force. What matters is his attitude toward it. Does he seek to employ the forces of nature and transform himself in order to reach the chosen destination, meaning that everything depends solely on him and his connection with this force? Or, does he look outside himself, seeking to alter the upper force, meaning does he approach the upper force, trying to use it for personal benefit so that it rewards him, which relates to his desire to change the whole world and take advantage of everything there is? Question: What does the mourner’s prayer (Kaddish) symbolize? Answer: When someone dies, we thank the Creator. Seemingly, for what, for the death of a loved one? However, we send gratitude at the spiritual level. We look from the height of the spirit, down to the desire to receive which shed its egoistic form by virtue of the Light, the Creator. Finally, He has made it happen. That part has died, and now I can realize the “revival of the dead” with it, meaning to take the desire that remains without an egoistic intention and begin to work with it for the sake of bestowal. After the death of egoism, meaning the intention to receive, only the “body” of desire remains. It is decomposing, and I can start working with it. Thus, I received a great deal of help from Above and thank the Creator for that. These are not simply words, but the feeling that bursts out of a person when his egoistic desire dies at last. The Kaddish appears contradictory in our present egoistic understanding. In fact, all our prayers, precepts, and rituals don’t correspond to the laws of our life. All of them are absolutely illogical, irrational in our eyes because they are the projection of spiritual laws. Question: We know that “Isra-El” is a calling and not just a stamp on an identity card. Yet, is there a special task for those who live in the geographic state of Israel? Here is the place with the most suitable conditions. Thus, if a person is drawn to spirituality, in a sense he is drawn here. It is impossible to establish the state of Israel on Madagascar or in Uganda. The law of the spiritual root and branch acts here, and this has to be taken into account. Thus, we don’t have a choice. We are here and have to build a state of love and bestowal here, setting an example for the entire world. Only in this way can we defeat enemies, achieve independence, and avoid any new victims. Answer: It is brotherly love. Every nation has its inherent love because the nations take their origins from the 70 roots of Zeir Anpin. These roots have a place for every nation. That is why people feel a connection to the mutual root. Despite egoism and individualism conspicuous today in everyone, people have a sense of belonging to a particular nation. This feeling is common to all nations except the Jews. After all, Israel is not a nation; it has no root in those 70 roots. Of all the nations that inhabited Ancient Babylon, Israel was made of people with the point in the heart. They separated from the others and joined together because of this spark. When the spark blazes and connects them, they live at the spiritual level, welded by their points in the heart into a single soul. But when this soul breaks, their vessel disappears, and they fall into regular desires, the desires of other nations. Then, Israel stops being a nation because nothing connects them besides the hate of others toward them. Only external pressure keeps them together. If the pressure decreases, they become dispersed as far as possible from each other. They exist in comfort namely when their connection is weakened. We can see this in the Jews living among other nations. When will Israel become a nation again? It will only be when they assemble around the message that Abraham laid in the nation’s foundation: “Love thy neighbor as thyself.” It must be done not for themselves, but for the sake of the world. We are at the last stage of redemption, the final correction, which has to embrace the entire world. Baal HaSulam writes about this in his articles “The Revelation of Godliness (Matan Torah)” and “The Mutual Guarantee.” Israel has to be united for the Creator to correct everybody through them. Desiring to correct themselves, Israel raises MAN, a plea for the entire world. Then, it receives the upper Light, the Light that Reforms. This Light moves through the “template” called Israel and obtains the right form of unity. 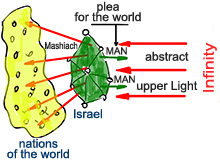 The Light is abstract and formless, but here it acquires the form called Mashiach (Messiah). Then, the great desire of the nations of the world becomes corrected. If we act in this manner, we are Israel. If we don’t, we receive blows and troubles, both from the upper Light and the nations of the world. We are in the middle between them. Either we perform the coordinator’s task, or we are worse than everyone else and have to suffer the consequences directly from the Creator and indirectly through others. The Light must find its vessel, and until then, it will not calm down. By not being able to exit the will to receive for oneself and feeling the need for the Creator’s help, a need is born to be assisted by the Creator. The Creator’s help is through the Torah because the Light in it reforms him, meaning he receives vessels of bestowal. Our sages said, “The Creator said, ‘I have created the evil inclination, I have created the Torah as a spice [for its correction],’” meaning that the Torah and Mitzvot spice [correct] the evil inclination, to give it flavor, for the evil inclination is called the will to receive. When it is for oneself, it is tasteless, for the restriction is over it, and it remains in a vacant space. But through Torah and Mitzvot, one reaches the intention to bestow, and with this vessel, called the “will to receive,” one receives all the delight and pleasure. Question: You liken the Jewish nation to a special forces unit that is sent on a special mission. Where to? Answer: It is sent to conquer the evil inclination. 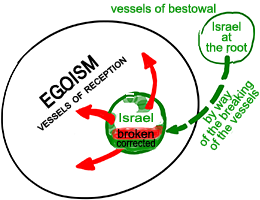 “Israel” is a spark, the point in the heart, the foreign force in the “hostile country,” in egoism. We must strive to defeat this egoism and correct it. We have to strengthen ourselves first, and then, having been reformed, we must give egoists the Light and correct the entire world. After all, it is true that we are not from here, not from the land of egoism. Our root lies outside of it; we infiltrated it by way of the breaking of the vessels, of the integral soul. Here, inside it, we were broken in the beginning, but in the end, we must become corrected. To the degree of our correction, we reform the collective ego. Question: Who is the commander-in-chief that sent the special forces unit on the mission? Answer: The Creator did. 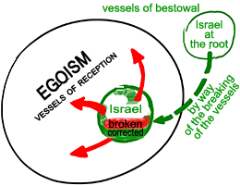 Israel is a part of Him, the vessels of bestowal sitting in egoism, in the vessels of reception. The commander-in-chief sent the soldiers out, having supplied them with all the necessary gear and ammunition. To cast them onto the hostile ground, He intentionally “broke” them up so that they may look like everyone else and not stand out in the crowd. Thus, we can be likened to secret agents. Each of us looks exactly as all the natives of this egoistic country. Imagine being dropped into Africa, and you look exactly like them: You have the same character, mentality, tastes, and likes. Everything is identical to theirs, inside and out. For a while, the planted agent doesn’t receive instructions. He has to settle in at the new site, find a job, and make a family. Years go by before he embarks on his mission. However, one day, he receives a reminder. By now, he has forgotten all about it when the phone starts to ring: “So and so is speaking….” It’s just like in a movie. We have received our wake-up call: It’s time to remember that we have a special mission here, that this is not, in fact, our home, that we came from a totally different world. In truth, we are from another “planet,” from another dimension. We received an impulse and came out of dormancy. All of the aliens on this planet have woken up, are gathering in the groups, and starting to prepare themselves to conquer the planet Earth. That’s our mission. Question: How do we win it then? Answer: We are being sent instructions, gradually explaining all that we need to know and put into action. Then, we gain a new mind and a new sensation. Our mother planet is sending us the power of our initial nature, with the help of which we will conquer every citizen of the Earth. We came here for one reason: to establish the same order here as exists in our own world. There, everything is opposite. It is governed by love and bestowal. Now, we must end all the horrors that are viewed as the norm here. People are destroying themselves and the life on the planet, while we have come to help, to save them and provide a totally different life for them. We were woken up by a special signal from home, on a special wave, which means that it’s time to act. I liken the Jewish people with a special forces unit that was sent on a mission with a special task. On the way, the unit encounters various problems. Some of the soldiers fail, and some make it further in since they understand the objective better. Suppose they went to another planet they knew nothing about. While there, they have to assess the situation and make decisions independently in order to take over a new territory. This group overcomes all sorts of obstacles, struggles through jungles and swamps, crosses a desert, deals with internal arguments, and goes through confrontations and reconciliations. It isn’t a bed of roses for the special forces unit sent to win planet Earth. I think the example I made closely describes a battle we are leading. It also explains our special attitude and consideration for the fallen friends and those who are calling us forth marking the path. The process consists of many stages. It is a real adventure, a history of incarnations of souls that time after time carry out the orders they had received, until they reach the final destination. When they come to the designated place, they must start preparing for the final combat. Everything would be fine if events would develop like in an adventure book; if we, similar to explorers of the new lands having crossed an ocean, would battle with natives, conquer or make peace with them, and so on. However, we have a different kind of war, an internal, not external, one. We can’t let out our ambitions and blaze through the external enemy in solid egoistic rows holding up a banner. We cannot employ our natural instincts: envy, hate, lust, vanity, and ambition in order to gain victory by force. We have a totally opposite process here. All of us, together, must win in the internal war. We constantly think that we are supposed to defeat an external enemy. In fact, it is just a game of imagination. If we conquer ourselves, the external enemy will vanish. However, in the meantime, we have to battle with it so that we may win “time.” So far, we exist in an uncorrected state that results in the notion of time. Thus, in order to free the space and time for ourselves to do spiritual work, we have to work on the corporeal plane as well. Hence, we live in the world which is split in two. One of its parts is material, and the other is spiritual. We should treat the friends in a similar manner. Some of them lead material battles, and the others lead the spiritual ones. Both make vital contributions to this exalted war, the purpose of which is to reach the end of correction. According to Baal HaSulam, many friends will fall on the path, and more will fall in the battle field, internal and external. However, in the end, all of them give their lives to reach the purpose of creation. Therefore, their souls incarnate and line up for the battle yet again, until all of them are transformed, having reached unity and adhesion. As for us, we must always look forward to the future, rather than to the past, and strive to battle internally, which will greatly reduce the external battles.